Our newlywed daughter and son-in-law have set an admirable food goal for the summer – knock as many places off Creative Loafing’s 100 places to Eat in Atlanta list as they can. When they called and asked if we’d like to meet for dinner, I told them to pick a spot from the list, in Buckhead, and we were on. 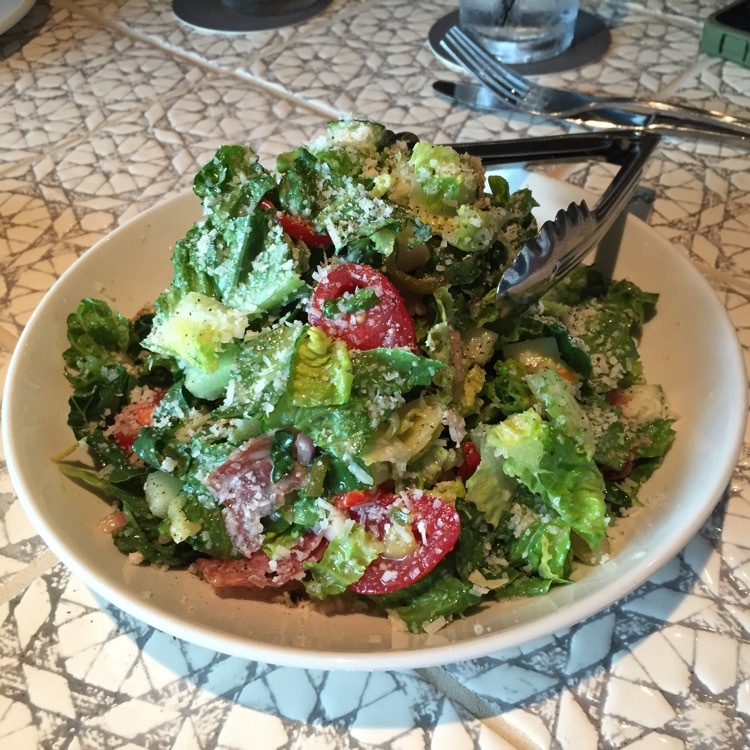 The chopped salad at Thirteen Pies made the list and off that way we all headed. 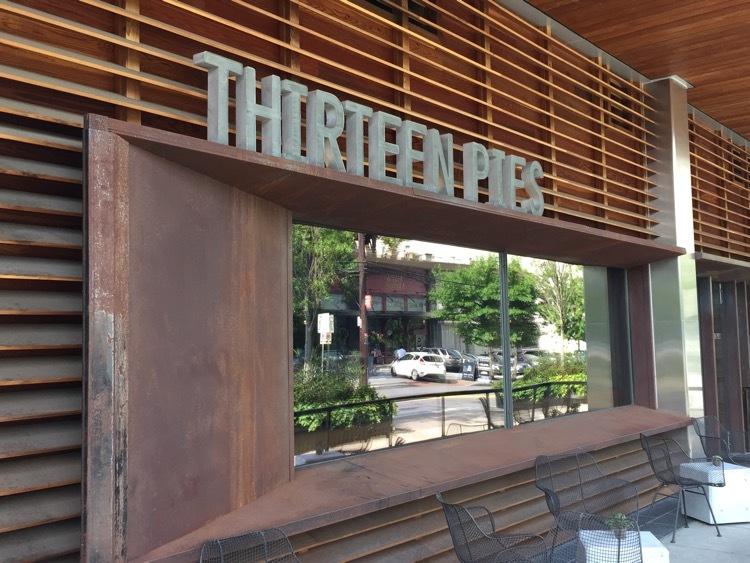 Thirteen Pies is the second location of a Fort Worth pizza place. They have thirteen pies on the menu – twelve standards and “number thirteen” – the daily special, hence the name. They are a sister resistant to American Food and Beverage Company (yes, someone possibly got paid to come up with that name), and are located just around the corner from AFBC in the Buckhead Atlanta development. If you haven’t made it to this development yet, it feels very Southern California – an outdoor “mall” of high end shopping and restaurants (and where the first Shake Shack in Atlanta has opened.) Parking is at a premium, in terms of spaces and cost, so be prepared. We did find some free parking on the street, but I am fairly certain that was only because the new parking meters didn’t have any “guts” yet. The interior is very nicely designed, with sleek woods, granite table tops and a large bar that faces the wood fired brick oven where they bake the pies. Since the chopped salad was on their list, the kids shared a salad, and my beloved has one as her entree, and I ordered pizza, as did they to share (on the other side of the table). The pasta had also received good marks in the reviews I read. 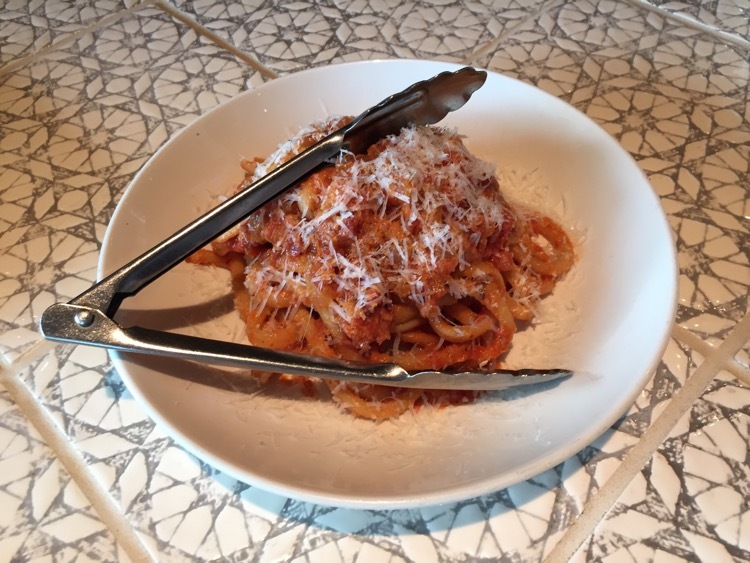 So we ordered the house made bucatini (with pancetta, tomato, onion, black pepper, red chili and pecorino) as a starter, to share. The sauce was thick and the dish was served piping hot. The combination of the pancetta and chilies, along with the pecorino, made for a mix of flavor that was hot, meaty and fresh. When the salad arrived, it resembled an antipasto (with cucumbers) and it was excellent (according to the three that ate it). Slightly spicy and full of flavor, they cleaned their plates. But everyone left cucumbers…. 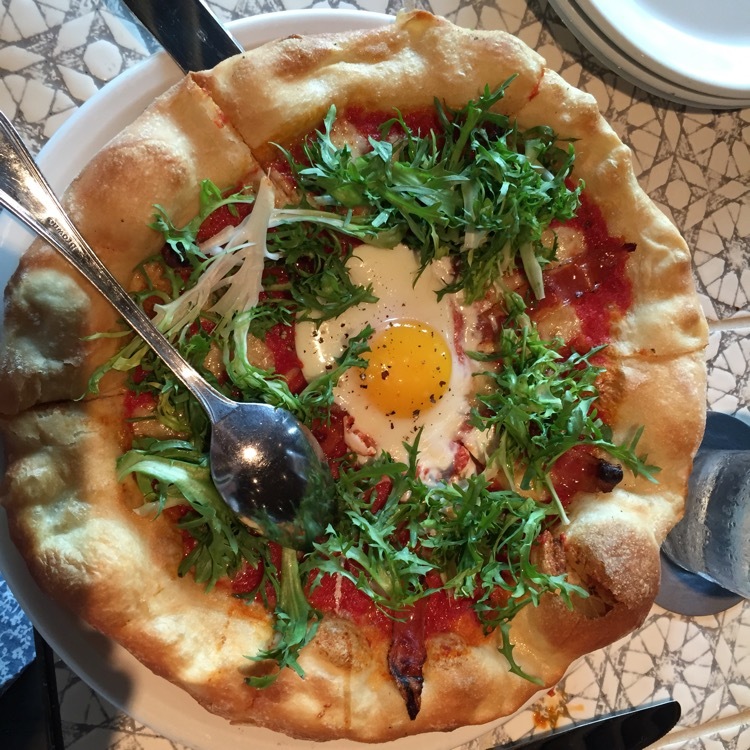 I ordered pie number nine – Spotted Trotter (a local charcuterie) guanciale with a farm egg, with gruyere, roasted onions (I had these held) and arugula. Guanciale is an Italian cured meat made from pork cheeks (jowls). It is similar to extremely salty bacon, like pancetta, but much more flavorful. The server offered to break the egg for me, but (being the independent type) I chose to do it myself. It was pointed out (by my family) that I should have let her break it, as she likely had adopted special egg breaking skills that I did not possess. The pie itself was fired in a brick, wood-burning, oven and was “firm” enough to hold up, without becoming limp, so you could eat a slice without folding it. Originally I was not looking for dessert, but then I saw that it was a strawberry-rhubarb crostini, with lemon ricotta. And vanilla bean ice cream. One, please. Our server said she’d bring back four spoons and I told her there was no need – I had no intention to share. 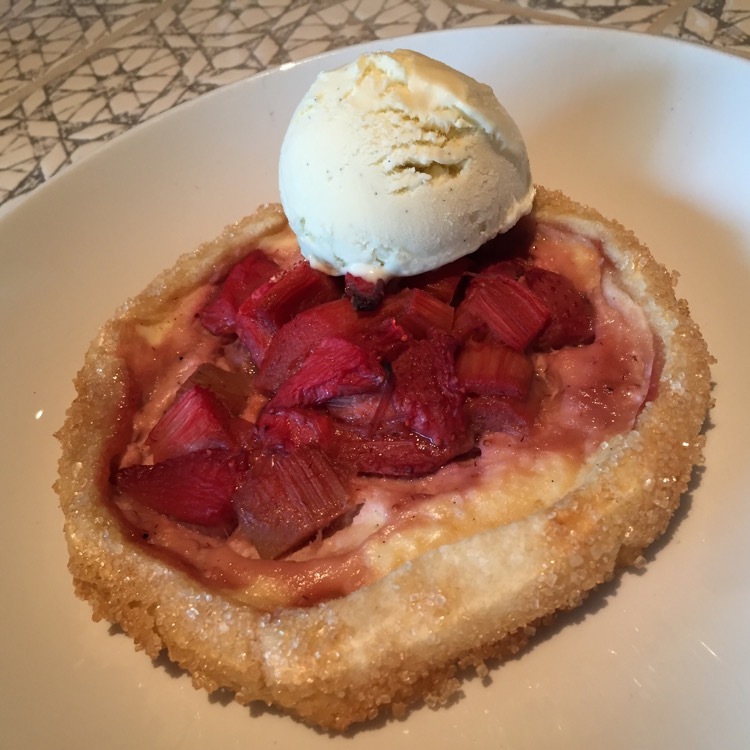 My history with strawberry-rhubarb goes back decades. It is my dad’s favorite dessert. And he believes that the the best strawberry-rhubarb pie is at a diner in Murdo, South Dakota. He found it on vacation in the early 70s and has been back there at least three times in the past 40 years. So, in honor of Dad, I ordered this crostini. It was awesome – warm, sweet and tart. And there was consensus, as I shared a few bites. Overall, it was good pizza, a great salad and really good dessert. Top that off with glorious company, and it was a very enjoyable meal. Wow, I am not going to lie, but this looks wonderful. Working at a Pizza restaurant has it’s perks, I just might have to try this out tonight after work! It’s always good to find something new!